Estella's Revenge: #AMonthofFaves: 5 Favorites for Winter Survival! #AMonthofFaves: 5 Favorites for Winter Survival! Today's #AMonthofFaves topic is wiiiiiide open with "Five Faves for Winter Survival!" Check out Girlxoxo.com and TravelingWithT.com, too! Not to mention all the great folks who are linking up their own posts down below! Tim Horton's coffee! 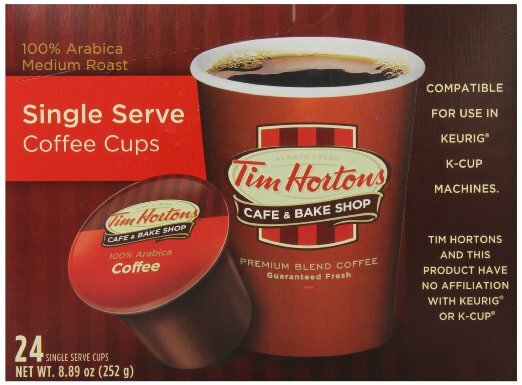 I've known about Tim Horton's for years, thanks to my Canadian friends. I'm not sure how my mom stumbled upon it, but she did, and now it's her favorite. I often find myself over at her house having coffee on a Saturday or Sunday mornings, and I go straight for this. 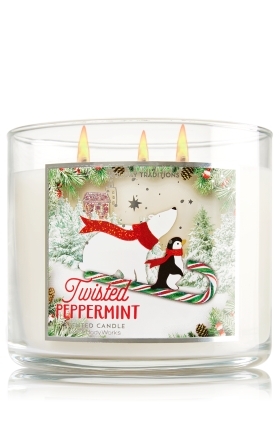 Bath and Body Works Twisted Peppermint candle! I am a candle ho for sho'. When the holiday scents come out, this one is my absolute favorite because it's a great blend of mint and sweetness. It's a heavenly smell, and it has great "throw." It'll fill up the house with scent. I hear Marshmallow Fireside is pretty good, too, but I just got my hands on it. Woodland creature ornaments (fox and owls)! We're day-after-Thanksgiving Christmas tree putter-uppers. We have a delightfully quirky mish-mash of ornaments...everything from childhood favorites from when I was a kid, to dinosaurs (from when Greyson was a baby), a few sports ornaments (our alma mater), and there's no shortage of cute woodland creatures, namely owls and foxes. Soap and Glory Hand Food hand cream! I've heard nothing but good things about Hand Food for as long as I've been aware of Soap and Glory. This was a brand previously sold in the UK and only at Sephora here in the US, but they've moved to Ulta, and that's where I do most of my makeup and skincare shopping. I love this cream for its light, fresh scent, and it is moisturizing without being greasy. Texas Trash! This is a long-time favorite holiday snack around our house. It's basically glorified Chex mix, and it's spicy! We make this in large batches so that we'll have plenty on hand at home and lots to give away to family. Nice winter survival items. We like hot cider and hot chocolate, scented candles (of course), and tons of throws (small, warm, soft blankets) for curling up in while reading. Thanks! I do love a good cider or hot chocolate. Girl, it was a mad house. Our store is small and had a line out the door because it was so full. 30 minutes in line. But I got eight candles for cheap! Jeans are my fave year-round, and scarfs/scarves for sure! I'll have to keep an eye out for Peet's! I need to look for that hand cream for sure! That is a great list! I'll have to try the hand cream. My skin is always dry and I'm always looking for a fix! Thanks! Me too. Working Hands is another good one, but it's better for nighttime because it's a bit greasy. Hand cream made it to my list too. I'll have to check out your recommended one! Yayyy, hand cream! Mine get so dry and terrible they crack. It's always an up hill battle. I love the Soap and Glory products I've tried so I'll definitely have to look for that hand cream. I really want to try Tim Horton's! I've heard of it but never tried it. I've only tried the one, but I really want to try others...like the Breakfast Scrub! I hope you like Tim Horton's if you get around to it! I loved Hand Food for years but the last tube I got was way perfumey!!! If I put it on at all, my entire office has issues with it. It's never been that strong before!! I may try the body butter in the lime scent. I love citrus. Right now I am addicted to the Satsuma cream from the Body Shop but I also love Bliss Lemon and Sage. Oh no! The bottle I had wasn't very strong. Smelled great, but it definitely didn't seem to travel. I wonder if you got a bad bottle? Bliss Lemon and Sage sounds amaaaazing. I've never used Body Shop or Bliss (yet). Yum...Texas Trash sounds fantastic...and can't beat that name! It is so yummy and crunchy and addictive! I feel very un-Canadian saying I don't like Timmy's coffee! I love the Twisted Peppermint candle though. My daughter is obsessed with Bath and Body Works. I don't like Starbucks coffee, so I think we're probably even there. Bath and Body Works is my faaaaavorite. I love The Twisted Peppermint candle and soap. I totally answered this question wrong....must have been too late at night and I misread. Stop by if you like. Ha, I'm with Chris - Tims is okay, but it's always my last choice. But she and I are a minority around here. Everyone drinks Tims! I love owls too. Adding that hand cream to my next shopping spree at Ulta. I'm going to look for that hand cream, too. Working in retail, I wind up washing my hands A LOT! I use either Nivea or Addison & Gates Citrus Blossom at night. The latter smells soooooo good! If I were participating in this meme, I'd add streaming good shows from Netflix. We're currently binging on Jessica Jones, now that we've finished Longmire. Great shows!